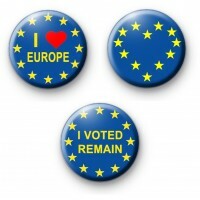 Set of 3, 1 inch Pro EU Badges. This set is for anyone that voted Remain in the recent EU Referendum. You get a Yellow & Blue Heart European Union Flag badge (EU flag badge), I love Europe badge and one that states I Voted Remain. So if you're Pro European and do not want Brexit you need this badge set. Lets all just say Bugger Brexit and Remain in Europe.